We’d love your help. Let us know what’s wrong with this preview of The Maid by Kimberly Cutter. It is the fifteenth century and the tumultuous Hundred Years War rages on. France is under siege, English soldiers tear through the countryside destroying all who cross their path, and Charles VII, the uncrowned king, has neither the strength nor the will to rally his army. And in the quiet of her parents’ garden in Lorraine, a peasant girl sees a spangle of light and hear It is the fifteenth century and the tumultuous Hundred Years War rages on. France is under siege, English soldiers tear through the countryside destroying all who cross their path, and Charles VII, the uncrowned king, has neither the strength nor the will to rally his army. And in the quiet of her parents’ garden in Lorraine, a peasant girl sees a spangle of light and hears a powerful voice speak her name. Jehanne. To ask other readers questions about The Maid, please sign up. However, once I started this title, it became very apparent that it wasn’t for me. There were several instances of child abuse and even a moment where Joan (who is called Jeanne in the novel) punches another child because they pick on her for being too religious. That made no sense to me, yes she had visions but historically speaking, the inhabitants of the villages in this time would be just as religious as Jeanne. I also thought that there was too much sexual content. I think it was a misplaced attempt to put emphasis on the fact that she was supposed to be virginal. In every chapter there seemed to be a man who wanted to sleep with her; leading her to have another monologue as to how important it was that she remains chaste. The sexual content became distracting. I could not get past the personality of Jeanne either. I was expecting her to be somewhat reserved, perhaps meek, yet still able to lead. Yet she came across as mean, bossy and self-righteous; the latter not being a compliment. I started this novel expecting to feel inspired by this character, when in actuality I was more so tempted to punch her. She expected everyone to listen to her (Yes, I know, she was hearing the voices of God and several Saints) but she didn’t extend that same courtesy to anyone else. Anyone who showed any hesitation to what she wanted, she treated like an idiot and an enemy. I wish I had more enthusiasm for this title, as I am a historical fiction freak and because I was really excited to read this one, but I don’t. There were too many things that I didn’t like about this title for me to really like the book. I do think that there will definitely be an audience for this book. Sadly, I am not the one of them. I went into The Maid knowing the Jehanne d’Arc story mostly from high school history class – and Luc Besson’s movie, The Messenger. I assumed this book would be a guilty pleasure – not necessarily something I’d want to read again, but fun, and hopefully only mildly irritating in its anachronism. After all, it’s hard to find a novel about a great woman in history that doesn’t insert modern sensibilities into the character’s mind, so I was bracing myself for a feminist re-write that down played Jo I went into The Maid knowing the Jehanne d’Arc story mostly from high school history class – and Luc Besson’s movie, The Messenger. I assumed this book would be a guilty pleasure – not necessarily something I’d want to read again, but fun, and hopefully only mildly irritating in its anachronism. After all, it’s hard to find a novel about a great woman in history that doesn’t insert modern sensibilities into the character’s mind, so I was bracing myself for a feminist re-write that down played Joan’s faith. But then I read the first page. The first thing that struck me is that Cutter takes Jehanne’s faith very, very seriously. And not only that, but she gives you a taste of it – her language is most inventive and fresh when she’s writing about Jehanne’s experience of God and the saints and angel that visit her. Perhaps the most amazing thing about The Maid is that it’s almost all completely true. Her predictions of the tide of battles, of one of her wounds, of the time of her own death; her jumping, unscathed, 50-70 feet from the tower where she was imprisoned by the Burgundians – it’s all true. Jehanne d’Arc was – and is – an extremely compelling, mysterious character in history. There’s still strong contention over whether she was carrying out a divine mission, or whether she was mentally (or physically) ill – whether she fought in battle with the French army, or was merely a standardbearer – whether she was raped in prison – how she managed to convince the dauphin and France to believe her and give her the means to complete her mission. As a Christian, I find her compelling and perplexing – with all the violence and nationalism integral to her story, she doesn’t fit easily into my idea of what a Christian looks like, but I can’t write her off as a lunatic. Cutter’s interpretation of Jehanne’s character was similar to Luc Besson’s movie -- the line between her divine mission and her often wrathful, prideful will is often unclear. But both sides are there – it is neither wholly one nor the other that drives her. This, together with Cutter’s vivid interpretation of Jehanne’s visions, makes for a character at once thrillingly unlike ourselves and yet still just as subject to the same human sins as any of us. We’re also made to feel the poignancy of how Jehanne’s apartness feels to her – to know that she will never be married to anyone but God, will never have children, and she is left to anticipate the time of her death; an apartness that, as Cutter notes in the book, perhaps only Christ shares. And there are many, many men – half a dozen, maybe – who remind her of her loneliness, and who she must keep at arm’s length to remain true to her mission. The book was a wonderful read, and I read it at a breakneck pace even as I knew the end – and her end – was coming. It was a hard read, though, too – it’s a book about total war, and includes many, many vivid battle scenes that are hard to take, as well as crude (but believable) language. It also includes at least one psychopath, Gilles du Rais, whose particular violent perversions are not only nauseating but linger in the mind. A nice touch was Saint Margaret calling Jehanne by the nickname “cabbage” – which is, strangely enough, a real term of endearment in French (“chou-fleur”). One thing that bothered me, though, was that while Jehanne is in every other way an orthodox (small ‘o’) Catholic, each mention of Christ appears without capitalized pronouns – God is He, Christ is he. This is extremely unusual and, for me, very distracting. This is perhaps the one solid criticism I can make, though, besides the difficulty with some language and violent scenes. Cutter’s book includes a brief factual note at the end, stating what things she interpreted, adapted, added or otherwise changed, as well as a list of books and authors whose work was helpful in writing The Maid – both of which are great resources that I’m glad to have. I also appreciate how closely Cutter hewed to the facts – she gave us her view of Jehanne’s character without spoiling the true story. Ultimately, it was a thrilling book , and I plan to reread it. It has reignited my interest in Jehanne d’Arc, and I’m happy to have read it. Author Kimberly Cutter recounts the short life of Jeanne d'Arc (Jehanne here), The Maid of Orléans and later canonized as Saint Joan of Arc. This is one of those too complicated bits of history to try to explain in a review, and Wik can most definitely do it better than I can. Joan's history is a fascinating one, and I've been eyeing novels on her for some time, so I was thrilled when this showed up on Net Galley. However, the book I read was very dry and the history itself is hard to follow - there seems to be an assumption the reader is well versed on the period. When I read a historical novel, I do so with the expectation that I will be educated and entertained at the same time, I don't expect to have to *read up* on the historical events before I begin the novel. The chapters were very short for the most part and I found this distracted from the overall flow of the story. I also didn't find any emotional connection with the characters, particularly Joan. I did not pick up on any grand passion nor religious fervor for her Godly mission. Overall, this was a dry and slightly disappointing read as it currently stands, but perhaps a bit of editing and fleshing out of characters can raise the bar a bit higher. I approached this book with some trepidation, since the only works about Joan I'd read (except Shaw's and Twain's) left me unhappy. I don't like anything that takes Joan's saints away from her, and one deep, abiding question I have--the question of Gilles de Rais, one of her great generals, later one of the most infamous mass murderers of children and the foundation for Bluebeard, burned at the stake himself for witchcraft and heresy--is never addressed in other works. The story starts at the end I approached this book with some trepidation, since the only works about Joan I'd read (except Shaw's and Twain's) left me unhappy. I don't like anything that takes Joan's saints away from her, and one deep, abiding question I have--the question of Gilles de Rais, one of her great generals, later one of the most infamous mass murderers of children and the foundation for Bluebeard, burned at the stake himself for witchcraft and heresy--is never addressed in other works. The story starts at the end and goes to the beginning, something that I always think is unnecessary. If the story is any good, it will carry us from beginning to the end, and we do know Joan lands in the hands of her enemies. But the storytelling is vivid and realistic, with no words spared for the grittiness and foulness of life, the nastiness of court politics, the smells, the mixed motives of human beings and their sheer pettiness, and their desperation. It is Joan who makes it all glorious, Joan's vision that makes the landscape glorious, Joan who gives the simple people the understanding that they can re-make their country and bring themselves some glory in their lives. If they lose that understanding, it is because they stop seeing things through her eyes. If she loses it, it is because people wear her down, and her own very real humanity wears her down. Those who are seeking a tidied-up, romanticized tale of Jean d'Arc and the 100 Years' War would be well-advised to look elsewhere. Kimberly Cutter brings us a gritty, realistic story about medieval warfare as she brings Jehanne, a young girl from Domremy (in the Lorraine) to life. Starting with Jehanne's childhood (including her sister's murder by the English), Cutter brings readers straight up through brutal battles, political intrigue both for and against Jehanne, and the girl's eventual execut Those who are seeking a tidied-up, romanticized tale of Jean d'Arc and the 100 Years' War would be well-advised to look elsewhere. Kimberly Cutter brings us a gritty, realistic story about medieval warfare as she brings Jehanne, a young girl from Domremy (in the Lorraine) to life. Starting with Jehanne's childhood (including her sister's murder by the English), Cutter brings readers straight up through brutal battles, political intrigue both for and against Jehanne, and the girl's eventual execution at age 18. We see her humiliation and her humility, her pride and her patriotism. Overall, Cutter shows us a complex young woman who is out of her depth dealing with the politics of her time -- but one who is so driven by her faith that she cannot envision failure. This is the kind of book that serious historical fiction fans love to get our hands on. It's fact-based and well-researched, and gives us insight to the characters we have read about in drier tomes at school. The Maid was one of my spontenious book-buys. Saw it on a bookshelf in Heathrow Airport, realised it was a book about Joan of Arc, thought to myself that I knew less than I would like about her life and work and thus concluded that I should buy it. It is a very readable book, written with the simplicity which is so characteristic of novels sold in airports during summer months. This simplicity, however, does not appear to effect the story itself, something which I personally felt was more the res The Maid was one of my spontenious book-buys. Saw it on a bookshelf in Heathrow Airport, realised it was a book about Joan of Arc, thought to myself that I knew less than I would like about her life and work and thus concluded that I should buy it. It is a very readable book, written with the simplicity which is so characteristic of novels sold in airports during summer months. This simplicity, however, does not appear to effect the story itself, something which I personally felt was more the result of the serious subject matter rather than Cutter's literary skills. Where Cutter does excell is at the portrayal of the complex character and psychology of the young Jehanne (Joan) who is thrust into a violent, masculine world of war and betrayal by a trio of angelic and saintly voices (namely those of Archangel Micheal and Saints Cathrine and Margaret). Saddly, Cutter never gives the reader any reason to doubt the authenticity of the voices and thus indirectly concludes that she was indeed a saint, a conclusion which many readers might find hard to digest. Whatever the case, Jehanne jumps out of the pages as a very special young woman (which she no doubt was) and her charisma and skill are justifiably emminent throughout the book. Her masterful portrayal of human -and female in particular- psychology is no doubt a result of the experience Cutter has gained from working with popular magazines in which, I am sure, she was faced with the letters of troubled teenage girls more than once (none of which concerned reclaiming France in the name of God, hopefully). Where Cutter really loses points in my rule book, is in her clumsy portrayal of the age. She describes army camps as smelling of gunpowder, in an age when cannons where used mostly (if not solely) for sieges and would most probably not cause an entire army camp to smell of their ammunition. Also Jehanne, for all her 'holiness' still a peasant girl, addresses her superiors by calling them 'sir' instead of 'your lordship'. Cutter needs to remember that medieval society was rigidly built upon hierarchical foundations and that anachronisms of the kind suffered in the book work towards misguided portrayals of an age which is terribly difficult to define and understand as it is. 3.5 stars for this nice debut. A very interesting read about Joanne of Arc, which mostly comes across as well researched. The chapters are really short, which some people object to, but which I always kinda like, as it makes the book seem like a box of candy. I've noticed another thing some people object to 3.5 stars for this nice debut. I've noticed another thing some people object to is the story being a bit hard to follow if you have no previous knowledge of this part of French history. I would like to recommend to first read "Blood Royal"/"The Queen's Lover" by Vanora Bennett and do some Wikipedia browsing. Another thing people object to is not being able to fully connect with Jehanne, and I fear I must admit to having that problem a bit myself. But I liked how at the end of the book, the chapters and Jehanne's thoughts seem to become a bit muddled. I thought this was a good way to show us how her power was gone and her doubts grew, and it made me connect more - Well done! There were sections that dragged slightly with a little too much war and bickering(of course that is expected)yet other sections completely grabbed my attention. After recently reading a very thorough non-fiction about Joan this book felt like it was well researched. The closer look at her life from a personal point of view, emotions etc. was nicely done and overall worth reading even for those who are not a particular fan of Joan of Ark. For those who are what a delight! I received a copy in exc There were sections that dragged slightly with a little too much war and bickering(of course that is expected)yet other sections completely grabbed my attention. After recently reading a very thorough non-fiction about Joan this book felt like it was well researched. The closer look at her life from a personal point of view, emotions etc. was nicely done and overall worth reading even for those who are not a particular fan of Joan of Ark. For those who are what a delight! The Maid: A Novel of Joan of Arc by Kimberly Cutter is an intimate portrayal of Joan of Arc’s rise and fall from her pivotal role in the Hundred Years War. It begins with Jehanne d’Arc as a twelve year old girl from Domremy, France, whose father is the tax collector and king of the peasants, so to speak. Life at home is difficult for her; Jehanne, her mother, and brothers have to endure the patriarch’s violent outbursts. Her beautiful sister Catherine had been murdered, which is the possible cat The Maid: A Novel of Joan of Arc by Kimberly Cutter is an intimate portrayal of Joan of Arc’s rise and fall from her pivotal role in the Hundred Years War. It begins with Jehanne d’Arc as a twelve year old girl from Domremy, France, whose father is the tax collector and king of the peasants, so to speak. Life at home is difficult for her; Jehanne, her mother, and brothers have to endure the patriarch’s violent outbursts. Her beautiful sister Catherine had been murdered, which is the possible catalyst for her father’s unpredictable behavior. One day, she receives a vision that sends her on a mission to save France from English invasion, as ordained by God. Her destiny is to bring Dauphin Charles VII to his rightful reign after having been cast out as illegitimate and humiliated by his mother, who sold out the French to King Henry V. Once she fulfills her destiny, she falls out of favor as a threat to the new king’s reign and is sold to the English, then prosecuted as a witch. Joan of Arc has been labeled saint, visionary, heretic, witch, etc. However, human is not one of those labels. The stigma of being labelled a saint is that the saint loses their humanity by being placed upon such a high pedestal. Ms Cutter does an excellent job of portraying Jehanne’s humanity: she is flawed, impatient, has a temper, has desires. The story doesn’t come off as feminist reading, which I appreciated (not that I have anything against feminist literature, but it would be easy to propagate that element in this story). Another thing I really appreciated about The Maid is that while everything centered around Jehanne’s religious beliefs, there is no religious agenda. I felt comfortable reading this book and didn’t feel like I was being slapped in the face with a Bible. The book was also well researched and historically accurate (except for Catherine’s death, which there is no record of what had happened to her) while still allowing for artistic license with Jehanne’s character. The writing was beautiful. At times, however, I felt the descriptions were flowery. I felt that the sequences where Jehanne is enraptured by God’s light were slightly contrived. It was difficult to imagine the people around her changing their views and feelings by seeing her enthralled, although, I cannot imagine that that is something so easily described. I also felt that the ebb and flow of the story was slightly awkward, as well as the switches from present to past tense when she rehashes her story to the priest Massieu. I also felt that the battles and everything in between were handled with too much brevity. All in all, I really enjoyed this book. Had I not won it on goodreads.com, I may not have read it until another year or two after its release. Excellent debut novel; I look forward to reading more of Ms Cutter’s works. If you liked this review, check out my other reviews at Random Pabulum! The Maid: A Novel of Joan of Arc by Kimberly Cutter is an intimate portrayal of Joan of Arc’s rise and fall from her pivotal role in the Hundred Years War. It begins with Jehanne d’Arc as a twelve year old girl from Domremy, France, whose father is the tax collector and king of the peasants, so to speak. Life at home is difficult for her; Jehanne, her mother, and brothers have to endure the patriarch’s violent outbursts. Her beautiful sister Catherine had been murdered, which is the possible catalyst for her father’s unpredictable behavior. One day, she receives a vision that sends her on a mission to save France from English invasion, as ordained by God. Her destiny is to bring Dauphin Charles VII to his rightful reign after having been cast out as illegitimate and humiliated by his mother, who sold out the French to King Henry V. Once she fulfills her destiny, she falls out of favor as a threat to the new king’s reign and is sold to the English, then prosecuted as a witch. l liked the quick pace and the short chapters. The author had access to a lot of research and the book could have become bogged down with historical detail and background, instead I got the sense of being in Jehanne's head, seeing and feeling what she did, understanding how everyone and everything looked to her. This book was a perfect intro to a complex historical figure. I got a feeling for the limited ways women could be in that era. Jehanne was such a departure from the norm that she really s l liked the quick pace and the short chapters. The author had access to a lot of research and the book could have become bogged down with historical detail and background, instead I got the sense of being in Jehanne's head, seeing and feeling what she did, understanding how everyone and everything looked to her. This book was a perfect intro to a complex historical figure. I got a feeling for the limited ways women could be in that era. Jehanne was such a departure from the norm that she really stood out. Today, short haired women wearing men's clothes and who speak their minds are normal. But in the 1400s it was heretical. I felt the power of Jehannes' conviction about hearing her voices. I don't think it was any mind disease, as has been alluded to, because how else could she have withstood the men of the church and even the french King's disdain for so long. I wish I had read the epilogue first because I didn't know that the whole book was based on well researched fact. It read like a young adult novel. What a cracking good read! I was expecting a dry history novel - this was anything but that! Not having studied this in school, I only knew of Joan of Arc as a young girl fighting for the French who was eventually burned at the stake. This book gave me her entire history and just WHY she did what she did. Written like a story rather than an historical recount, it was easy to get into and easy to just keep reading and reading. Highly recommend this book, well done Kimberly Cutter! Quite an excellent novel of the life of Joan of Arc. I wanted to read this in anticipation of my visit to France later this year. Found through Libboo The Maid ...The Maid: A Novel of Joan of Arc is in my opinion an excellent historical fiction with plenty of actual historical facts in it. Author Kimberly Cutter did a phenomenal job and capturing the story of the peasant girl, Jehanne d’Arc’s beautiful struggle. A woman would not have been treated with any real respect or dignity when it came to affairs that were considered a man’s work in the 1400’s but for a 17 yr old girl to leave all she knows because she truly believ Found through Libboo The Maid ...The Maid: A Novel of Joan of Arc is in my opinion an excellent historical fiction with plenty of actual historical facts in it. Author Kimberly Cutter did a phenomenal job and capturing the story of the peasant girl, Jehanne d’Arc’s beautiful struggle. A woman would not have been treated with any real respect or dignity when it came to affairs that were considered a man’s work in the 1400’s but for a 17 yr old girl to leave all she knows because she truly believes that it is God’s will and to be successful in influencing so many men in that was AMAZING! How could you not admire Joan of Arc. By convincing Charles, heir to the thrown of France to give a poor young girl such as herself command of his army because she has told him that God wants her to defeat the English and Burgandies as well as assist in seeing he is crowned King of France, one cannot doubt that Joan had great impact during the Hundred Years War. Kimberly Cutter captured the harshness of the time period as well as the awe inspiring events that really took place that elevated Joan d’Arc to one of the strongest female heroines of all time. If you can’t tell already, everything about this book impressed me. The writing style, the characters, the battles, struggles and the church depicted as a dictatorship in a way that could suffocate the most holy and devout of Christians. I will however say that at first the book did not capture my heart but toward the end I was in love with it. It was like watching an artist paint a scenery portrait, at first you may see some colors and not think much of it but when the artist is finally finished you can see the whole picture and it suddenly becomes amazingly beautiful. If you do end up reading this book then I highly recommend that you read everything, including the two epilogues and author’s note at the very end. It was all fascinating! Set in the fifteenth century during the Hundred Years War, The Maid tells the story of Jehanne d'Arc (later known as Joan of Arc) as she sets out to fulfill her destiny. Jehanne has grown up in the French countryside and watched as English soldiers tear the country apart. When she is young, she begins hearing voices and seeing angels that tell her that she is the one who will save the France and return the exiled Dauphin to his throne. After overcoming enormous obstacles, she does just this but Set in the fifteenth century during the Hundred Years War, The Maid tells the story of Jehanne d'Arc (later known as Joan of Arc) as she sets out to fulfill her destiny. Jehanne has grown up in the French countryside and watched as English soldiers tear the country apart. When she is young, she begins hearing voices and seeing angels that tell her that she is the one who will save the France and return the exiled Dauphin to his throne. After overcoming enormous obstacles, she does just this but soon falls out of favor with the new King and is sold to the English who prosecute her and burn her as a witch. I thought this was an interesting book and well researched but I have to admit that I had trouble getting into it and enjoying it. I never really connected with Jehanne, or any of the other characters, even though I wanted so badly to. She came across many times as two-dimensional and I couldn't see the religious ferocity she was supposed to project. The battle scenes were interesting but I felt that the rest of the book could have used more detail. Joan of Arc seems like she was such an amazing person so it was a little disappointing that the story felt so flat. I didn't hate the book, I didn't even really not like it, I just wish there had been a bit more to it and that I had made a connection with the characters. This is an interesting, and well written debut book, which focuses on the life of Jehanne d’Arc. The story begins, when as a child, Jehanne bewilders her peasant family by her religious zeal, and her ability to communicate directly with saints. Guided by her religious voices, Jehanne sets out to change the focus of European history, when, convinced that God has chosen her to restore power to the French, she embarks on a brutal, and courageous fight for glory. Startlingly honest in its narrative, This is an interesting, and well written debut book, which focuses on the life of Jehanne d’Arc. The story begins, when as a child, Jehanne bewilders her peasant family by her religious zeal, and her ability to communicate directly with saints. Guided by her religious voices, Jehanne sets out to change the focus of European history, when, convinced that God has chosen her to restore power to the French, she embarks on a brutal, and courageous fight for glory. Startlingly honest in its narrative, and loaded with religious fervour, I thought the book explained the historical period very well. The chapters are short and concise, yet manage to convey a huge amount of historical information. The characterisation is excellent, from the historically accurate figures, to the lowly foot soldiers; all seem to blend seamlessly within the narrative. After every section I forced myself to stop reading 'The Maid' so that I wouldn't stay up all night reading it and so that I could savor each part and delay ending the wonderful experience of reading this book! Sometimes the conversation seemed too modern day, but otherwise an excellent book! Joan of Arc is a far-famed and widely recognized name, especially if you're a. Catholic or b. French. As a rebel, as a saint, and even as a peasant, this young girl captivated an entire country, following her 'voices' and fighting the English for freedom. Taglined with "the girl who led an army, the peasant who crowned a King, the maid who became a legend," Cutter sets the stage for her version of the world famous knight right from the get-go. I did Read This Review & More Like It On My Blog! Joan of Arc is a far-famed and widely recognized name, especially if you're a. Catholic or b. French. As a rebel, as a saint, and even as a peasant, this young girl captivated an entire country, following her 'voices' and fighting the English for freedom. Taglined with "the girl who led an army, the peasant who crowned a King, the maid who became a legend," Cutter sets the stage for her version of the world famous knight right from the get-go. I did have to do some reading up on the Hundred Years War during and after reading this because a few details were blurry in my memory and I wanted to check the validity of the events in this novel (medieval France is not my historical forte). Happily, and incredulously I might say, I found much of this novel to be factually correct, all the while maintaining a snarled plot and a brisk pace. Even the most incredible events from the book are recorded as fact (Jehanne's predictions of a defeat at Rouvray, telling Charles "Use me. I will last little more than a year"), and Cutter does a fine job of meshing the facts of the past with her interpretation of the person. She also steers clear of the inane repetition of titles and names of the nobility that some other historical fiction authors cannot seem to avoid. I thought that this was a well-told tale, and Ms. Cutter a more than able storyteller. Never dry, or dull, I was swept up in the story from beginning until the end and her Jehanne is more than believable: she is three-dimensional and vibrant. The story is told by Jehanne herself, explaining her life up to capture by the English to her seemingly sympathetic jailer in a brisk, almost unfeeling reminisce. With the Hundred Years War raging from 1337 (before her death) until 1453 (twenty years after her execution), Jehanne begins and lives her entire life directly in the tumult of this dynastic warfare, and it leaves a lasting impression on the girl. With the third person perspective in use Cutter is deftly able to weave a complete - and devastating - picture of life in English-controlled France. And it is a harsh, unyielding picture full of mostly misery. With the external pressures of a mad father, a murdered sister and a devastated country, it is not hard to see why she turned to prayer for solace and then began to hear voices. Though The Maid plays the voices as if they are actual saints (Michael, Catherine and Margaret to be specific), it is not hackneyed element nor a podium from which Jehanne preaches. I did find the pet names from the saints to Jehanne a bit off ("cabbage" and "darling"? I could see "lamb" I suppose, as in lamb of God, but it wasn't used) and it threw me when one of the three would reference Jehanne with one of them. Jehanne was also never full of herself, simply stating she was "a lamp in which God had chosen to burn for a short time." Her humility rang true, and remained the forefront of personality for the duration. Moving at a brisk pace, the novel shows Jehanne through five parts, divided by age or events within. Jehanne's early life was surprisingly compelling for a peasant in medieval France, and Cutter shed light and personality upon the mostly-historically-ignored family that brought Jehanne into the world. The abduction and murder of her sister Catherine at the hands of the "Goddons" (English), though one of the fabricated events, served as a nice foreshadowing of Jehanne's future treatment by the same nation, and also served to explain more of Jehanne's reasons for her calling. Her relationship with her father was severely troubled, a symptom that reappears in almost all Jehanne's later interactions with men and possibly the reason for such issues in the first place. Jehanne is shown to be a full, complete person: she doesn't survive of religious fervor. The author took care to craft a well-rounded personality who can feel and express doubt and fear instead of an unfeeling zealot: her latent feelings and romance with the Duke of Alencon, her struggles with violence, and even nostalgia from home.. these are all problems with which Jehanne must wrestle and overcome. Jehanne grows into herself: from a shy girl turned away from the dauphin, she becomes a ferocious general, dealing with insubordination and mistrust with ease. Cutter does an admirable job of showing a human side to a saint venerated for her supreme piety. Slowly, her Jehanne is revealed as a woman that is much admired, but sadly not liked within her support base. I think I found the wikipedia article on Joan of Arc more exciting than this book. It is far too modern in its speech/behaviors and the characters are far too flat. It doesn't help that I just finished (finally) A Game of Thrones, and this book absolutely pales in comparison. This is almost a real-life version of Game of Thrones: different kings vying for the same throne, a child leading armies, massive intrigue and brutal deaths. The real-life people of this story are as compelling and deep as a I think I found the wikipedia article on Joan of Arc more exciting than this book. It is far too modern in its speech/behaviors and the characters are far too flat. The real-life people of this story are as compelling and deep as any Game of Thrones character: Joan herself, an illiterate peasant girl who helped lead France's armies to victories over the English, at a time when hope was nearly lost for her country; Charles The Mad, king of France during Joan's childhood, who thought he was made of glass and once slaughtered his own knights because he confused them with traitors; Charles the VII, the young king who owed Joan his throne but ultimately left her to die; Sir John Fastolf, an English knight who led men against Joan's forces and who may have been an inspiration for Shakespeare's Falstaff; Georges de la Tremoille, Charles VII's advisor and Joan's political opponent, who let personal jealousies undermine his support for France's best military commanders; and of course Gilles de Rais, one of Joan's military leaders who would later be better known as a serial killer of children. Joan of Arc in real life must have been a young girl of incredible intelligence and breath-taking charisma. You do not lead a country to war by being mousy and boring. Wikipedia tells me that Joan's trial record reveals her remarkable intellect and wit. Yet the heroine in this book radiates no cleverness or charisma. Like everyone else in the novel, she is incredibly bland. Besides the fact that I found myself incredibly bored and disappointed while trying to read this book, I was also irked by everyone's attitude toward Joan. No, not the "help, help she's being oppressed for being a woman!" That is par for the course in ye olden days and if this was a better book, it would've been oh-so-satisfying watching Joan use men's low expectations against them (people underestimating you can be a useful tactical tool) and watching Joan triumph over her doubters. No, what annoyed me was the fact that Cutter portrayed Joan's medieval world as incredibly secular as the modern world. It wasn't bad enough that everyone spoke like they were in the modern day, they had to act as if they lived in it, too. Look, I understand that not everyone back then was super-religious, or that even if people were religious (or even members of the clergy!) it didn't mean that they weren't primarily focused on secular concerns. Some people used religion as a tool for manipulation/power even back then (and I would have been happy if a patron/king's advisor/the king/whoever would see Joan's religious reputation as a perfect tool for manipulating/whipping up the populace, and play along with her religious aspect while not actually believing she could talk to God). We know the story. How it starts and how it ends. So, why bothering reading another book about Joan of Arc? Well, this book superbly fills in the periods between the historically documented events. This is a story of Jehanne whose beloved older sister is raped and murdered by the English. Their father grieved the death of his favorite child like a madman - screaming, sobbing at the sky, and hurling himself against trees. When he finally returned home, he slept. For a year. When his We know the story. How it starts and how it ends. So, why bothering reading another book about Joan of Arc? When his father came out of this grief-stricken lethargy, he became clairvoyant. He saw terrible things about Jehanne's future in his dreams, and they horrified him. Jehanne suffered beatings at his hands before, but after her sister's death, she could not walk for a week after one of his savage beatings. The more he tried to control her life, the more defiant she became, in little ways he couldn't directly detect. Then the final straw came when he arranged a marriage for Jehanne. After having watched the wretched lives of women around her, Jehanne would rather die than get married and lead a miserable life with a husband who would beat her. She decided she'd rather die. About the same time, her voices came to her. The voices told her to do things that were impossible for a peasant, let alone a peasant girl to accomplish. She was instructed to raise an army and to drive the English from France. She must lead the Dauphin to Reims to be crowned. How was she to accomplish all this? Well, she started by teaching herself to ride and fight. Then she raised her army by persuading one important man at a time. The courage to face the entrenched enemy and the tenacity to stay with the struggle when she was betrayed by the very man she was trying to crown king of France was inspiring. How did she do it? Or the better question is, why did she do it? Why didn't she just walk away? Others have. Other knights and men have abandoned their struggle and went back to their homes, why not Jehanne? She knew she would die. She had an inkling of how painful her death would be, but she stayed the course, even after it seemed as if her voices abandoned her, too. But as soon as she followed God's instructions, the voices came back. Finally, she was able to face her horrific death with comfort and peace. I can't imagine what it would like to have your greatest fear or joy (depending on how you look at it) come to life. I don't think it'll be a blessing to hear voices in my head, even if they tell me they are angels. How do I know they're who they say they are? I'd like to believe Jehanne was very human. That she felt all the joys, sorrows, humiliation, rejection, and rage that anyone would feel under the circumstance, but she marched forward and followed God's will. But I kept thinking - why didn't she just walk away? Or could she walk away, even if she wanted to? Did she have anything to walk away to? Had she walked away and returned home, what would await her? I think she'd be a ruined woman - situated uncomfortably somewhere between a saint and a whore. Ruined either way. Who'd want to bed a saint? That would be blasphemy, right? And remember, she wore men's clothing and intermingled with them freely. Either she'd have to get married and she'd rather die than marry. Or she might be locked away in a convent for the rest of her life. Maybe a horrific, heroic death was better than slow, spiritual death by physical, emotional, and mental abuse. Bodily death would follow in time. Maybe too slowly. I recommend this book because it won't let me go. I keep thinking about it, even several weeks after reading it. I reviewed this book for luxuryreading.com. I think it’s fair to assume that most people have at least heard of Joan of Arc (or Jeanne d’Arc). We’ve read of or seen the movies depicting Jeanne on her divine mission to rid France of the invading English and put the rightful King on the throne. However I, for one, did not know the full story of where she came from and how she ended up a martyred saint of France. 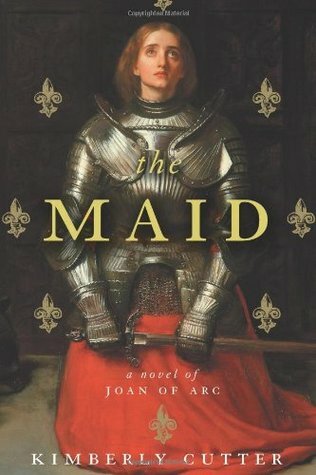 The Maid by Kimberly Cutter has done a wonderful job of bringing Jeanne to life and givi I reviewed this book for luxuryreading.com. The Maid by Kimberly Cutter has done a wonderful job of bringing Jeanne to life and giving me a firmer grasp of who this young, brave maid was and what she really did for the God, and country, she loved. In The Maid Jeanne relays her story – from dirty, abused farmer’s daughter in Domremy to captive prisoner of the English – to a priest named Massieu. We learn of her humble beginnings and her firm belief that she was born for so much more than the meager, cruel life of a farmer’s daughter and eventual wife. When she is visited by the powerful voices of saints in her parents’ garden at the age of twelve, she realizes that she cannot be tied down to any man but must do whatever God commands in his service. And what he commands is for her to ride through France, lead an army to fight off the English and crown King Charles VII in Reims. For me, the beginning of Jeanne’s story was slow going. Once she leaves Domremy behind and begins her quest, however, the story becomes unputdownable. It’s action-packed and you cannot help but cheer for Jeanne in the hopes that she will be able to fulfill her mission and find some happiness in this cruel land she’s been born into, even as we’re told she is destined to die early on. The language and violence can be harsh at times but I felt it helped showcase the brutality of the war and warriors that Jehanne was surrounded by. The final betrayal by Charles VII and the seeming abandonment of her saints were devastating, but her ultimate decision to either live as a liar or die as a righteous daughter of God brought her story to a sad but satisfying conclusion. I have always had a "thing" for Joan of Arc. Book reports and essays in school too numerous to count. When I saw an historical novel about her I grabbed at it and thank God I was given this advance. I LOVED this book. So many stories have been told about Joan but none that makes you feel what Joan felt like this one. Much of the book is based on true history - events and what times were like - the rest filled in to give us this enlightening account of Jehanne d'Arc. Jehanne was, above all, dedicat I have always had a "thing" for Joan of Arc. Book reports and essays in school too numerous to count. When I saw an historical novel about her I grabbed at it and thank God I was given this advance. Jehanne was, above all, dedicated to God and her religion. She believed her voices were her saints, giving her strength, courage, and determination. Given those things to help her survive her peasant, destructive family and the horrible death of her sister. Given those things to help her be stubborn and persuasive, getting her army together, getting men to follow this lowly maiden. Cutter's story is exquisitely told. I never wanted to put it down. The fluid, beautiful writing bore into my heart and soul. I felt Jehanne's pain and agony, I felt Jehanne's adrenaline and power, and most of all felt Jehanne's light and love for God. I understood the passion that overtook her, that sometimes made her doubt, but that was always there to guide her forward to her destiny. Cutter gives us a perfect interpretation of what the times were like, what the warriors were like with their booze and their women. This was so important to understand, that this young peasant virgin got men of this kind of rawness to follow her in order to save France. It was something I feel I never "got" as completely as I finally did reading The Maid. Joan of Arc is, to me, the greatest woman in history, religious or otherwise. The Maid is the book that finally does her, who she was and what she did, justice. I started reading this book knowing next to nothing about Jean of Arc and quickly found myself hooked on the story. It facinated me how a girl of seventeen could achieve so much, be so brave. However, though she was a brave and fierce leader, she started out as an uncertain girl, which I thought was good, because it made her seem human and relatable, rather than just the legend she has come to be. After all, despite the things she achieved, she was still just a girl. The book was quite simply wri I started reading this book knowing next to nothing about Jean of Arc and quickly found myself hooked on the story. It facinated me how a girl of seventeen could achieve so much, be so brave. However, though she was a brave and fierce leader, she started out as an uncertain girl, which I thought was good, because it made her seem human and relatable, rather than just the legend she has come to be. After all, despite the things she achieved, she was still just a girl. The book was quite simply written, but I think that style of writting fitted nicely since it is the story of Jehanne, who was an illiterate peasant - it would have seemed weired and out-of-sorts if it was complex and poetic. Also, I think the simplicity of the sentances often made the reading more intense, especially when Jehanne was pulling that arrow out... that actually made me cringe. A few times, I did find myself getting confused as to who was who, since there are so many characters and a few have similar names, but at the same time, the Author's Note at the end explains that they are all real and that pretty much all of the events were also real, hence why there were so many characters. I was also really pleased to hear that pretty much everything that happens in the book actually happened - I love it when a book sticks to the true events rather than embelishing them. All in all a very good book, which would be great for Jean of Arc fans, or for anyone who just wants to know a little bit about her. This book had been on my To-Read shelf for a long time, and it was well worth the wait. I knew nothing about Joan of Arc going into this story, and I walked out learning lots. Granted, it's historical fiction, but Cutter remains amazingly authentic to the "true" historical accounts. I, like many other people, found Joan to be truly inspiring. Being the first trans person at my school, I related personally to her in many ways. I admire Cutter's ability to blend fact and fiction together into a com This book had been on my To-Read shelf for a long time, and it was well worth the wait. I knew nothing about Joan of Arc going into this story, and I walked out learning lots. Granted, it's historical fiction, but Cutter remains amazingly authentic to the "true" historical accounts. I, like many other people, found Joan to be truly inspiring. Being the first trans person at my school, I related personally to her in many ways. I admire Cutter's ability to blend fact and fiction together into a compelling novel. While reading this, I started reading about the history of The Hundred Years' War, Henry V, and the Battle of Agincourt. It was really cool to learn about this in a fictional novel and to have a sort of personable attachment to the real life "characters." I was even sent into a bit of an existential crisis while reading this. I was amazed that we knew so much about someone from 600 years ago. If you look on Joan of Arc's Wikipedia page, we have her signature preserved. And a doodle of her from someone during her court trial. These seem like such insignificant things, and here they are, preserved 600 years later, able to be seen by anyone with an Internet connection. What will be preserved from our time in 600 years? Whose court doodles will make it into an encyclopedic page? Additionally, part of me was even disheartened by this book as well. Joan fights through so much sexism throughout her short life, and even though it's 600 years later, we still have just as much, if not more insidious, sexism. In 600 years from now, what will sexism look like? I didn't know much about Joan of Arc, so it was an interesting read. The author includes in the end what is true and what is fiction. Other than a little graphic, which it would be, it was written pretty well and very interesting. I couldn't help wanting a different ending for her. In the end of the book, the author says that some think instead of hearing from her voices and dreams, she had epilepsy or schizophrenia. I can't speak to schizophrenia, but I can speak for epilepsy or migraines. My si I didn't know much about Joan of Arc, so it was an interesting read. The author includes in the end what is true and what is fiction. Other than a little graphic, which it would be, it was written pretty well and very interesting. I couldn't help wanting a different ending for her. In the end of the book, the author says that some think instead of hearing from her voices and dreams, she had epilepsy or schizophrenia. I can't speak to schizophrenia, but I can speak for epilepsy or migraines. My sister had one, and I have the other. We've never heard voices, dreamed dreams, or seen visions before, during, or after an attack/episode/seizure. I've heard people say this about migraines - that they make them more creative or create new visions - which is why I include that. I only find it makes for misery, as my sister also said for epilepsy. I believe Joan of Arc did hear the voices of angels and saints, dreamed dreams of things to come, and all without the suffering of any disabling disease. I'm glad I read this, although saddened that we still torment people such as her. I believe there are more like her, but we are too frightened of them to allow for the good they might otherwise do. A simple peasant girl is born during the Hundred Year's War in Domremy in 1412. She learns how to read and write only one word - her first name - Jehanne. Her sister gets murdered by the English. She escapes both an abusive father and a forced marriage. At the age of sixteen, she starts having visions of saving France from English invasions. Her visions are very clear, she needs to get to Chinon before mid-Lent in order to save France. It's not an easy task for a peasant girl to get to the King. A simple peasant girl is born during the Hundred Year's War in Domremy in 1412. She learns how to read and write only one word - her first name - Jehanne. Her sister gets murdered by the English. She escapes both an abusive father and a forced marriage. At the age of sixteen, she starts having visions of saving France from English invasions. Her visions are very clear, she needs to get to Chinon before mid-Lent in order to save France. It's not an easy task for a peasant girl to get to the King. She prays vigorously to receive help. With the received help, she meets the `King' who at the time is Dauphin and later thanks to her gets crowned as king. While the `King' makes his decision, she learns how to horse ride, joust, swordplay and studies attack strategies. The decision is made and Joan of Arc leads her men. One fight after another is successful until the first arrow pierces her back. Maybe this is the first sign of her losing her powers. The scene of her getting out the arrow is so vivid that it is painful to read it. At the end, she gets captured due to the lack of support from the King. Her own people betray her, most of all - the King who doesn't pay her ransom. She receives unfair trial. She gets a second chance, but her choice is very clear. As we all know, at the very end she gets burned at the stake in Rouen. My only problem with this story is the foul language. Otherwise, this is a very engrossing story, which I honestly was not expecting. Abandoned. I wanted to listen to this, read by Rosalyn Landor, but after two tries, I couldn't stand the squishy descriptions nor Jeanne herself. Not my cup of tea. Definitely fits into the new genre “historical thriller” since I already know about Joan of Arc’s story; this book focused on the journey and got the reader hyped to see how everything would play out. More of a direct storytelling versus narrative, but still effective. For fans of historical retellings. Author of THE MAID. Second novel currently under construction.